Visit the world's most colourful and fanciful park, one of Gaudí's modernist masterpieces in Barcelona! 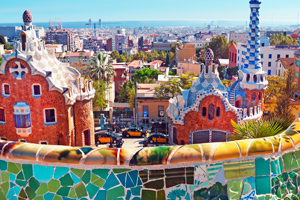 Visit one of the most striking and unusual parks in the world, designed by the famous Catalan architect, Antoni Gaudí, and admire the spectacular views of Barcelona from its multi-coloured terraces. Whatever you do, don't miss out on a visit to Park Güell, it will amaze you, just as it has amazed so many thousands of tourists before you! Thanks to the shared Tour of Park Güell, you will be able to visit one of Barcelona's most iconic locations and one of the most original places in the world, in the company of a local guide! With a cost of just €28.00 per person, your tickets will include fast-track access and a guided tour lasting one and a half hours! Book your shared tour now on the booking form on this page. The multi-coloured Catalan mosaics, the 86 columns in the Hypostyle room and the dragon's staircase provide a truly unique setting, unlike anything you will ever have seen before. The majestic dragon's double staircase, thus named because of the famous dragon that lies at the bottom of the stairs and which has become a symbol of the city. The Hypostyle Room in which you can admire the 86 doric columns in the form of a tree. The tour will last about an hour and a half and at the end, visitors will then be free to wander around the park and take photos whilst enjoying the fabulous views of Barcelona from on high. By booking the Tour of Park Güell, you can be assured of enjoying your experience in the company of a professional tourist guide who speaks your language. Upon receipt of payment, you will receive an email confirmation that you would need to print off and bring with you on the day of your visit. Tours in English are available daily at 12 AM. With a private tour you can visit any attraction with a private guide and only in English, only for you and your group. Click here for a private tour. English speaking tours are available every day of the week at 12 AM.